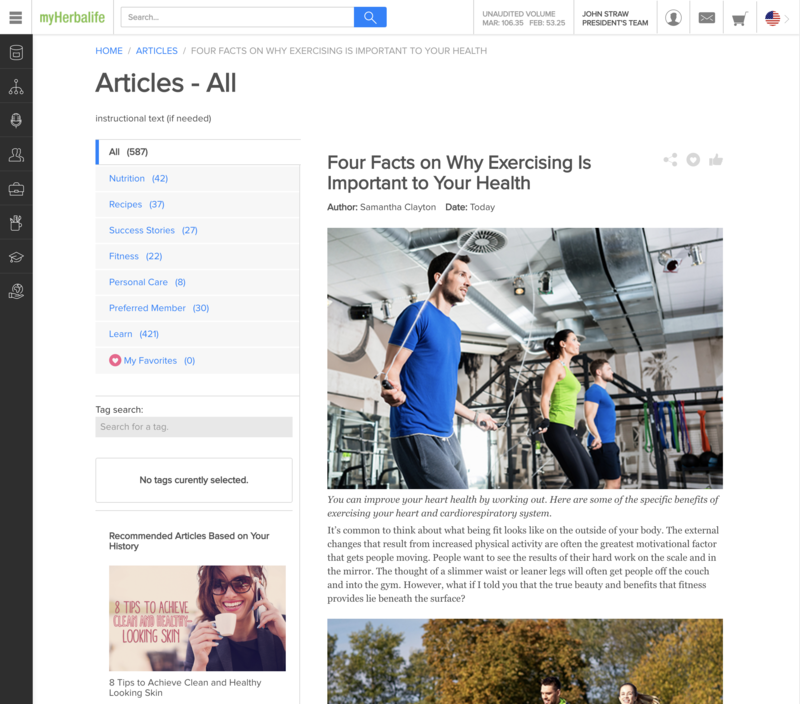 For this project, I was tasked with redesigning the Herbalife articles module. Current Articles is out of date. It was built in a hurry just to “get something out there”. There is no way to track popularity of an article. There is no way to search for articles that are relevant to my goals. There is no way to monetize or up sell products in articles. There was no way to correlate sales to articles. Give users the ability to easily find articles relevant to their goals. Allow them to easily share these articles. Give them a way to act on related products right from an article. Show a relationship between new articles and sales generated from related products. Design and development were on the same page almost immediately and throughout the duration of this project. The translation between prototype and production was great. The main thing that didn’t go so well was the lack of decision makers in the initial design phase. Our team came to consensus very quickly, and moved through the user story, sketch and prototype stages fast. Once we got to the design review with decision makers, we ran in to a different understanding of what articles should be as well as its purpose. We were operating with the goal to inform and educate users on products. To help drive a healthy lifestyle and show our products really work. Decision makers viewed articles and a vehicle to drive more sales. This is where the monetization came in. Be more vocal and insistent about getting decision makers in the room during the design phase. I was relatively new to the company at this point, so I brought it up, but didn’t press the issue. Get buy in right away, as well as get their insights on business need. “Like” an article – adds metrics to see trends on popular content, which will help provide engaging and relevant content people connect with. Smart tag search – the ability to search multiple tags to get articles specific to my needs and health goals.